? ? ? ? ? ? My name is Evie and I am an Irish artist living in Galway City. ? 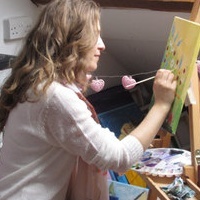 I am strongly influenced by the Irish landscape and culture, and love to paint whimsical scenes full of vibrant colour. ? Aveline Craft & Design is my new giftware range, that includes my designs on greeting cards and tote bags. ? Thanks for stopping by and enjoy the gallery!